The project directed by Dave Tynan is written by and stars Emmet Kirwan, in a blend of spoken word, performance art and short form narration. Both Tynan and Kirwan were at the awards ceremony last Saturday, April 8th to accept the award, which was presented to them by Chris Walley and Alex Murphy of ‘The Young Offenders. "'Heartbreak' is a groundbreaking, brave and innovative film made outside of the usual production models, which broke all the rules, connected with an enormous audience via social media and proved that short filmmaking has an important place in the culture of the nation." "Saturday was brilliant, really special. I said on stage that making films with your mates meant a lot to me and that's my abiding memory of the night, hanging out with guys I love working with. It's also more recognition for an incredible piece of writing and performance from Emmet; no one else could have done it. Hopefully the award helps us all moving forward. I don't feel I'm close to done working with these lads so hopefully this helps with where we want to go next." ‘Heartbreak’ reached almost a million views on YouTube in just two days when uploaded by the team last January. The MDV production is produced by Michael Donnelly (Rockmount), Dave Leahy (See You) and Liam Ryan (Wifey Redux). It also stars young talent Jordanne Jones as Youngone, a teenage schoolgirl who becomes pregnant and tries to raise her son in modern Ireland. 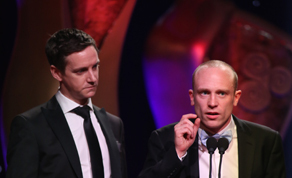 The awards ceremony airs on RTÉ One tomorrow, Tuesday April 11th at 22:15.